Beret’s are very simple and versatile hats to crochet. They are created with simple intervals of increases, decreases and working even. Use a smaller hook for a stiffer hat or a larger hook for a slouchy hat. Or you can always crochet less in the beginning circle to create a smaller hat, or more to create a wider hat. Leave it as is for a casual addition to your wardrobe, or attach a pom-pom for a more traditional look. If you haven’t tried making one yet, give it a try and see what I mean! Gauge Swatch: 2’’w x 2’’h (5 cm x 5 cm) ch 8. Pattern is worked in a spiral, so use a stitch marker to mark the beginning of each round. Note: Rounds 1 – 20 will create a circle. Note: Rounds 21 – 24 will lengthen the hat, and are worked even without increase or decreasing the circle. Note: Rounds 25 – 29 will decrease to circumference of the hat. Note: Rounds 30 – 33 will create the band. 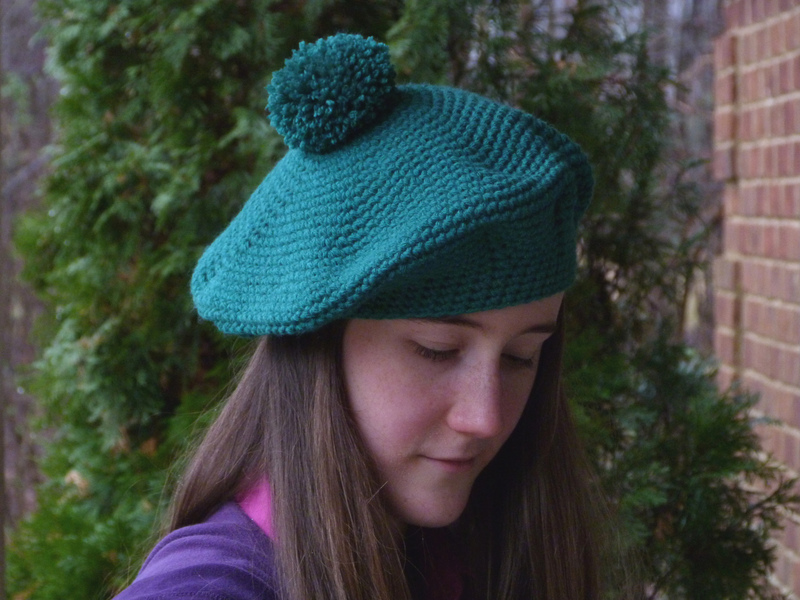 Use a template or pom-pom maker to make a 3” pom-pom and sew to center of beret. If you have any questions while crocheting then don’t hesitate to leave a comment! I’ll be glad to help. This entry was posted on Monday, January 28th, 2019 at 12:00 AM by Amy	and is filed under Free Crochet Patterns. You can follow any responses to this entry through the RSS 2.0 feed. You can skip to the end and leave a response. Pinging is currently not allowed. To make a larger hat you will simply need to increase the beginning circle a little more. For example, rounds 1-20 build the circle of the hat so go ahead and continue increasing in like manner for a few more rounds. Then go ahead and follow the remaining instructions. Keep in mind that because you have enlarged the pattern, in the decrease rounds (rounds 25-29) the stitches will not come out even as the pattern says. But don’t worry, it should work out just the same. Let me know if you run into any more problems!